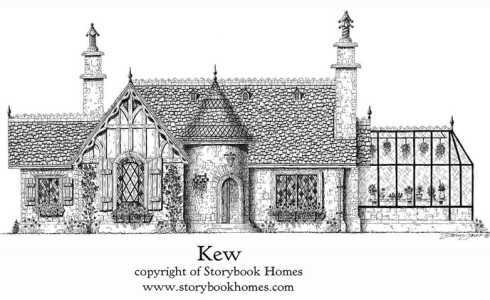 Storybook Home Plans...Old World Styling for Modern Lifestyles! The enchanting storybook home plans included here feature fairy tale cottage styling combined with interior floor plans and amenities designed for present-day living. Blending period charm with modern day convenience gives you the best of both worlds . 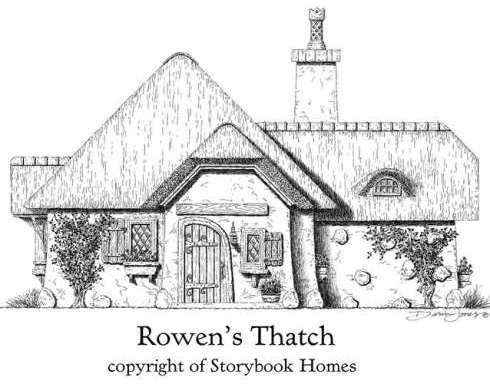 . . . . . . and few stock plan providers do it better than the aptly named design firm of Storybook Homes! Based in Midway, Utah, Storybook Homes specializes in French and English-inspired cottages based on authentic cottage architecture of rural France and England. 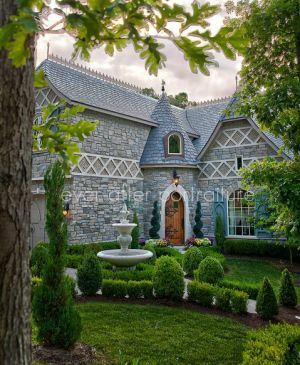 True to the Storybook Style, this firm's picturesque designs feature stone or stucco walls -- or a combination of the two -- with or without half- timbering. Steeply pitched roofs with varying roof lines covered in tiles or thatch -- or shingles designed and arranged to simulate thatch -- are punctuated by dormers and large decorative chimneys with ornamental clay chimney pots. Shuttered, multi-paned windows and arched entry doors add to the charm of these architectural jewels. In addition to its stock storybook home plans, the firm offers custom designs. The charming cottage style home pictured at top and below is a custom designed home for one of its discerning clients. The two small cottage house plans that follow are one level designs that range from 941 square feet to 1,732 square feet in area. Each has a lovely thatched roof with an eyebrow dormer. "Rowen's Thatch," pictured directly below, features a stone and stucco exterior with a rustic -- albeit charming -- wood entry door, window trim and shutters. A large stucco chimney crowned with a decorative clay chimney pot soars above the roof line. Inside, an efficiently arranged 1 bedroom, 1 bath floor plan with a spacious Great Room makes it appear larger than its 941 square feet would normally dictate. This cottage plan features two fireplaces -- one of which is in the bedroom. The Great Room, which also features a fireplace, includes two sets of double French doors that lead to an outdoor stone terrace. 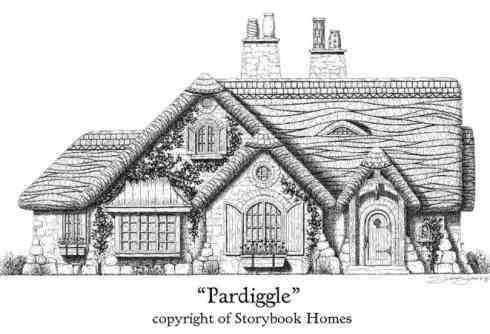 "Pardiggle," the storybook home plan that follows, simply oozes period charm with its "layering" of architectural elements! Multiple front-facing gables grace the stone facade, as well as a proliferation of multi-paned windows, including a large bay window. Pairs of shutters flank the windows with arched tops, and an arched wooden door provides a welcoming entry. Two large stone chimneys of varying heights -- each capped with a pair of individually styled clay chimney pots which also vary in height -- lend a picturesque silhouette to this fairy tale cottage design. At 1,732 square feet in area, the interior of this storybook home plan features 3 bedrooms, including the master suite, and 2 full baths. The kitchen and dining area flow into the parlor (living room) to create a large open space. A walk-in closet, dual sinks and a separate tub and shower complete the master suite. Though still quite common in the U.K., only a handful of firms in North America use thatch as a roofing material today, due to the extensive training and years of apprenticeship required to become a Master Thatcher. One such firm currently operating in the United States with the experience and proper credentials is MgGhee & Co. Roof Thatchers, based in Staunton, Virginia. 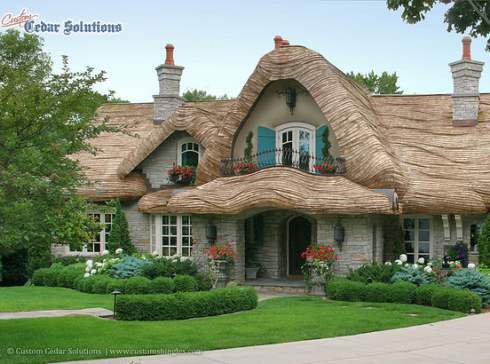 Alternatively, a good way to approximate the look of a thatched roof is with steam-bent wood shingles. Custom Cedar Solutions of Lake City, Florida is one North American firm that does outstanding work of this type. 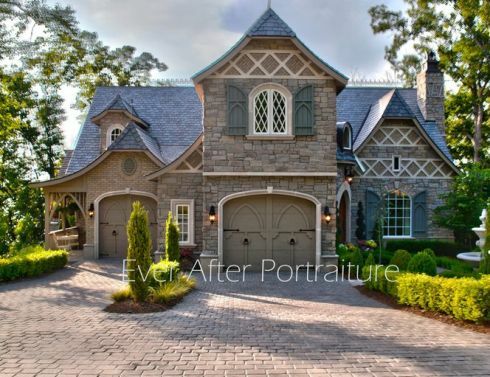 Pictured below is just one example from their incredible portfolio! Each of the two storybook home plans that follows is one and a half stories in height with two levels of interior living area ranging from 2,706 to 3,999 square feet. Instead of thatch, tile is used as a roof covering. 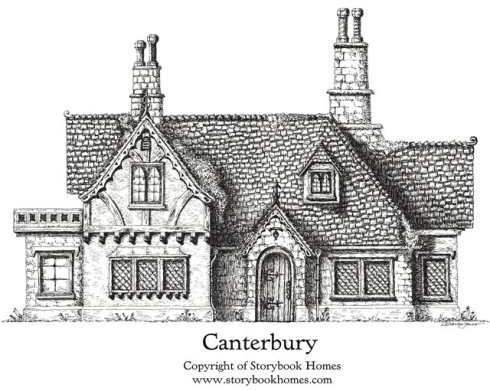 The "Canterbury," shown below, is another highly picturesque design from Storybook Homes. It features a stone and stucco exterior with decorative bargeboards and half-timbering on the upper level of the front-facing gable. Rows of quaint diamond-paned windows illuminate much of the lower level, while natural light penetrates the upper level through gable and dormer windows with divided lights that are mostly square, but rise to a pointed arch at their tops. Prominent twin stone chimneys of varying widths and heights soar high above the rooftop and send billows of smoke through their ornamental clay chimney pots. 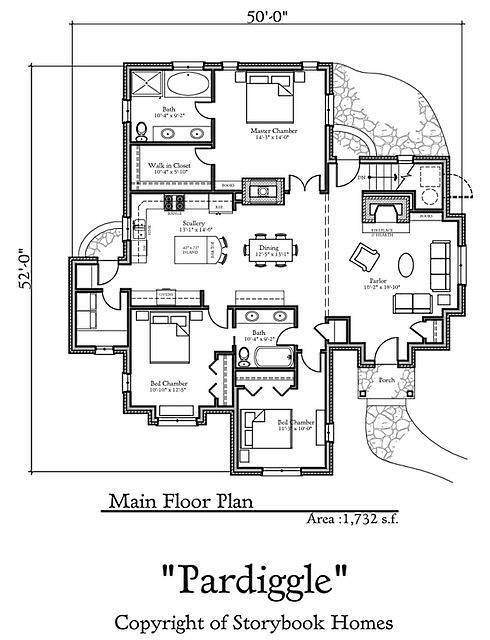 Pictured below are cottage floor plans for both the main and upper levels of the "Canterbury." 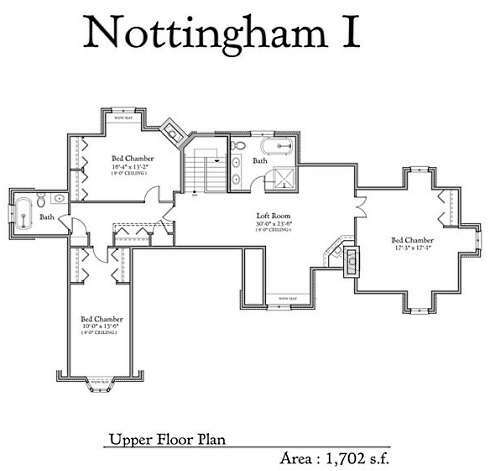 The main level plan of 1,547 square feet flows from room to room around a central staircase and, in addition to a bath, includes a library with a fireplace and coffered ceiling, a parlor with a fireplace, and a dining room with a beamed ceiling. The plan also features a gourmet kitchen with a center island, larder and butler's pantry, as well as a sunny breakfast nook. Upstairs, an additional 1,159 square feet encompass a guest room and full bath, along with the master suite, which also includes a fireplace. The master bath features dual vanity sinks, a private toilet room, a separate shower and tub, and a large walk-in closet. 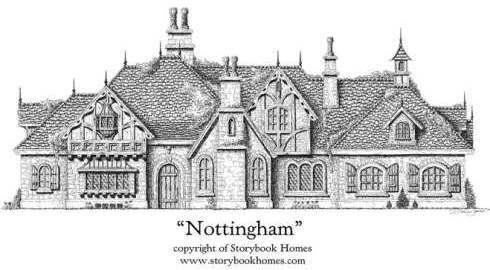 Up to this point, the storybook home plans we've looked at do not include garages. Not to worry. Storybook Homes also designs carriage house style garages in keeping with the character and look of their storybook home plans. Pictured below is a sampling of the firm's garage designs. 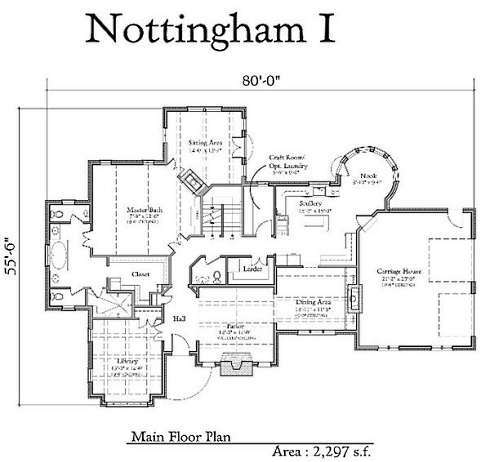 At just under 4,000 square feet of living area, the "Nottingham," pictured below, is the largest storybook home plan showcased here. With picturesque stone, stucco and half-timbered exterior walls, it features a playful roof line of both hips and gables of varying heights, pierced by multiple decorative chimneys with chimney pots, as well as dormers, finials, and a cupola. 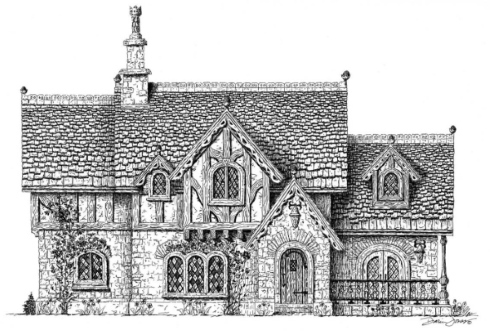 A profusion of diamond and square-paned, arched-top windows punctuates the facade, including a large bay window on the main level and a small oriel window on the gabled jetty, or overhang, directly above it. 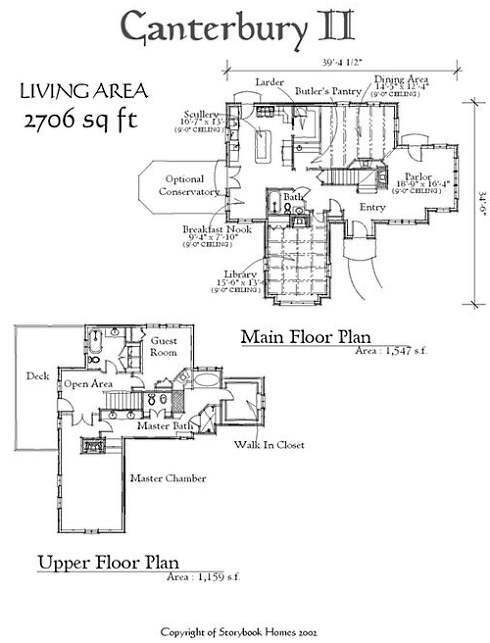 Inside, the main level encompasses 2,297 square feet of living area which includes a library, parlor with fireplace, and dining room -- all with beamed or coffered ceilings -- a powder room, and a kitchen with a cozy breakfast nook. 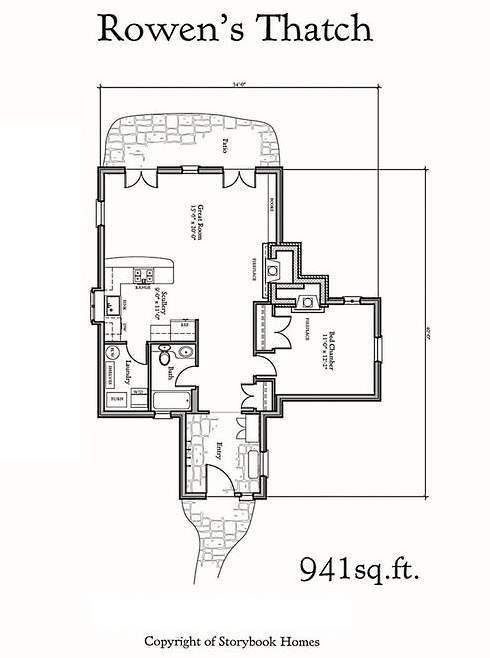 Also occupying the main level is a huge master bedroom suite with a sitting room, fireplace, bath with dual sinks, separate tub and shower, large walk-in closet, and "His" and "Her" private toilet rooms. An attached two car garage completes Level 1. The upper level adds another 1,702 square feet of living area to the home and includes 2 full baths and 3 bedrooms with an abundance of closet space. Between the bedroom wings is a large "Loft Room" with a built-in window seat and a corner fireplace! 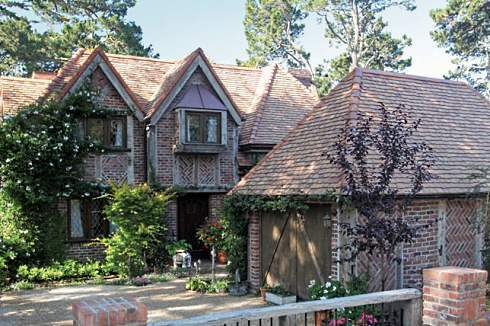 As with thatch, the use of clay tiles as a roofing material dramatically enhances the beauty, value and "character" of a storybook home. And like thatched roofs, a clay tiled roof is highly durable, with a life expectancy of 70 to 100 years. Imported from Europe and around the world, clay roofing tiles are available in a wide range of sizes, styles, shapes and colors. One of the largest suppliers of clay roofing tiles in North America is Northern Roof Tiles, based in Ontario, Canada. The charming English cottage style home pictured below sports a beautiful tiled roof from Northern Roof Tiles. For more information about the uniquely charming cottages from Storybook Homes, please click here to visit their website. Please check back often or subscribe to our RSS feed, as we frequently add new storybook home plans to our site. Hobbit Huts to Cottage Castles!